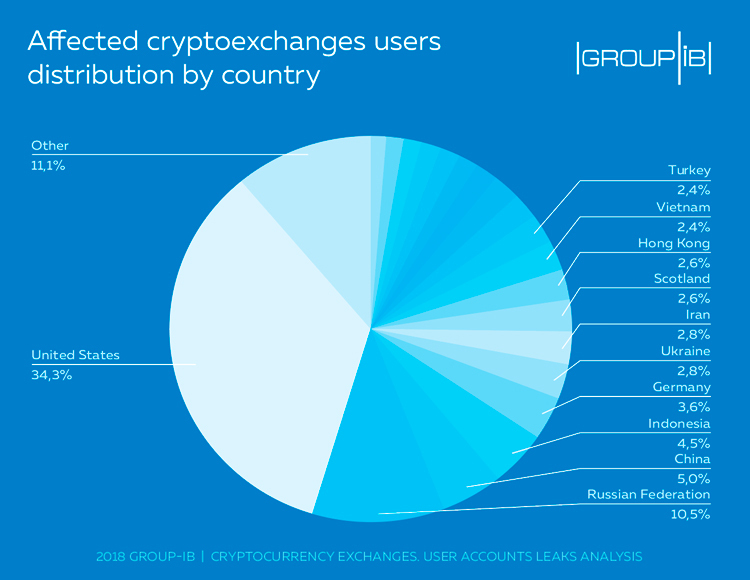 Group-IB, an international company specializing in preventing cyberattacks and developing information security solutions, has investigated user data leaks from cryptocurrency exchanges and has analyzed the nature of these incidents. Within a year, the number of data leaks soared by 369%. The USA, Russia and China are TOP-3 countries in which registered users became the victims of cyberattacks. The company’s report shows a steady increase in the number of compromised user accounts on cryptocurrency exchanges. In 2017, their number increased by 369% compared to 2016. The first month of 2018 set a record: due to growing interest in cryptocurrencies and the blockchain industry, in January the number of incidents jumped by 689% compared to the 2017 monthly average. The USA, Russia and China are the countries where users are targeted most often. The study has shown that every third victim of the attack is located in the United States. 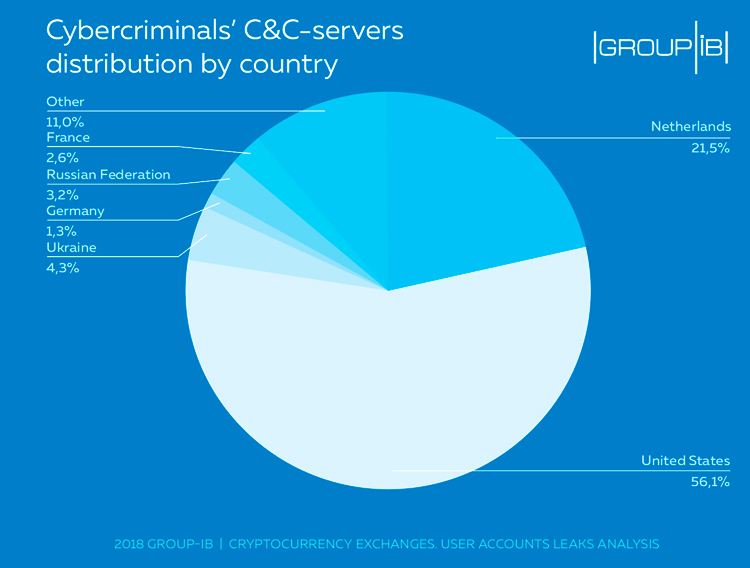 Increased fraudulent activity and attention of hacker groups to cryptoindustry, additional functional of malicious software related to cryptocurrencies, as well as the significant amounts of already stolen funds signals that the industry is not ready to defend itself and protect its users. In 2018 we will see even more incidents. This situation requires prompt and effective response of all stakeholders, including experts in different areas. 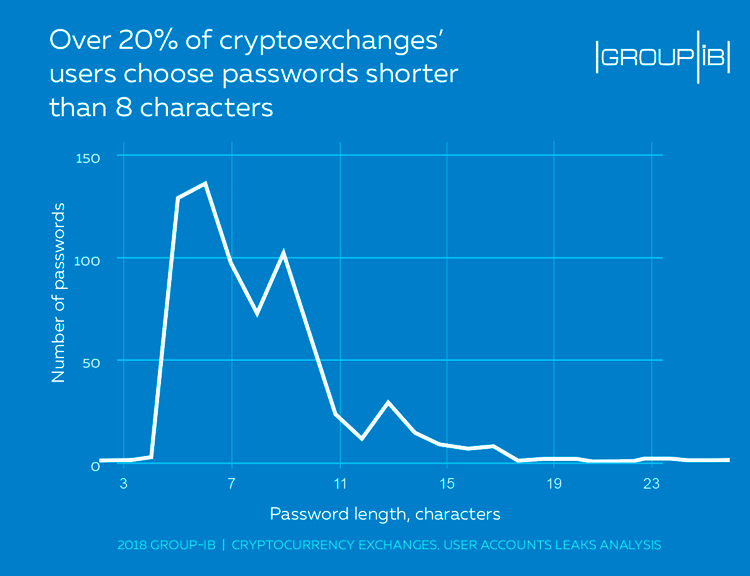 In order to protect one’s funds against crypto-fraud, Group-IB recommends users to be mindful of their passwords (which should contain at least 14 unique symbols), never use the same passwords for different exchanges and always enable the 2FA (two-factor authentication). Experts recommend avoiding the use of public Wi-Fi (at least when carrying out exchange transactions) and paying special attention to one’s «traces» on the social media. For instance, users should not demonstrate the fact that they possess any cryptocurrency.